round 2: with same color you’ll crochet into the ring: 3 chains (=1e dc), 3 dc’s, 2 chains, * 4 dc’s, 2 chains **; repeat 2 more times from * to **; slip stitch into the 3rd/top chain of your 1st dc (= 3-chain stitch), fasten off. 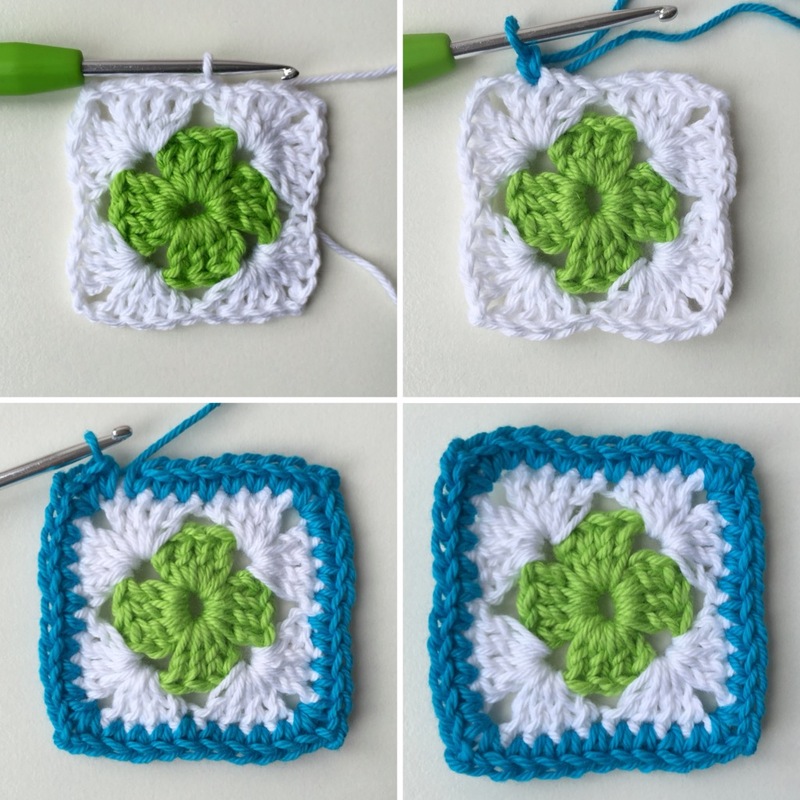 You should now have 4 clusters of 4 dc’s (and 2-chains in each corner); round 3: new color: attach yarn in any corner (= 2 chain space), and crochet (in each corner): * 4 dc’s, 2 chains, 4 dc’s ** (your very first dc of the first group of 4 dc’s is – again – a 3-chain stitch); repeat from * to ** 3 times. Close this round by slip stitching into your 1st dc (the 3-chain stitch). Fasten off; round 4: new color – attach yarn (in any stitch), and crochet 1 sc in each dc you crocheted in the previous round. 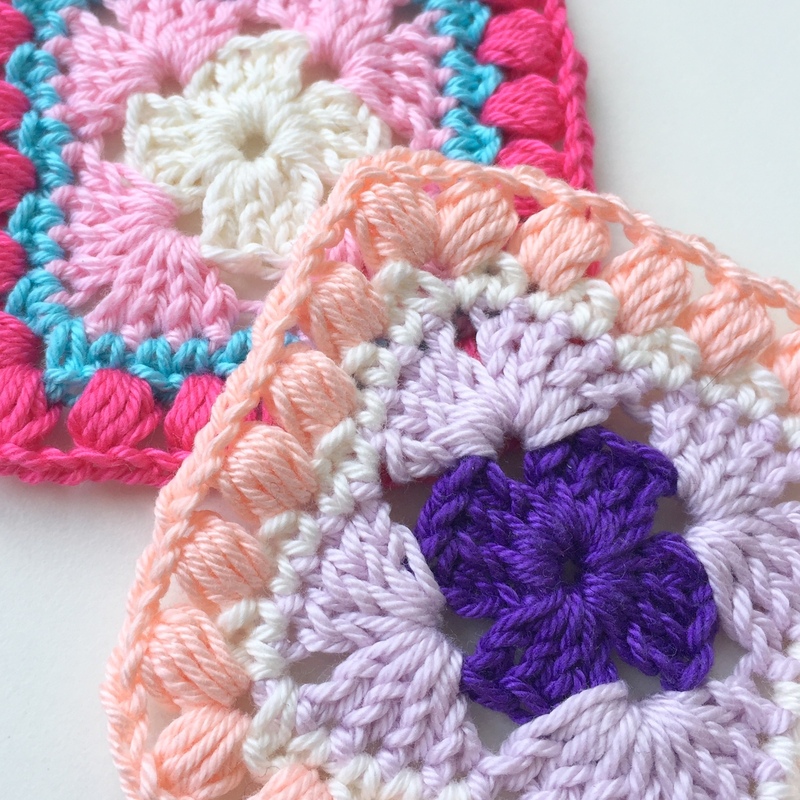 In each corner, you’ll crochet: 1 sc, 2 chains, 1 sc. Go all around, and fasten off. round 5: new color – in any corner, you’ll crochet: 1 “start” bobble (see note 1), 4 chains, 1 (regular) bobble (see note 2). 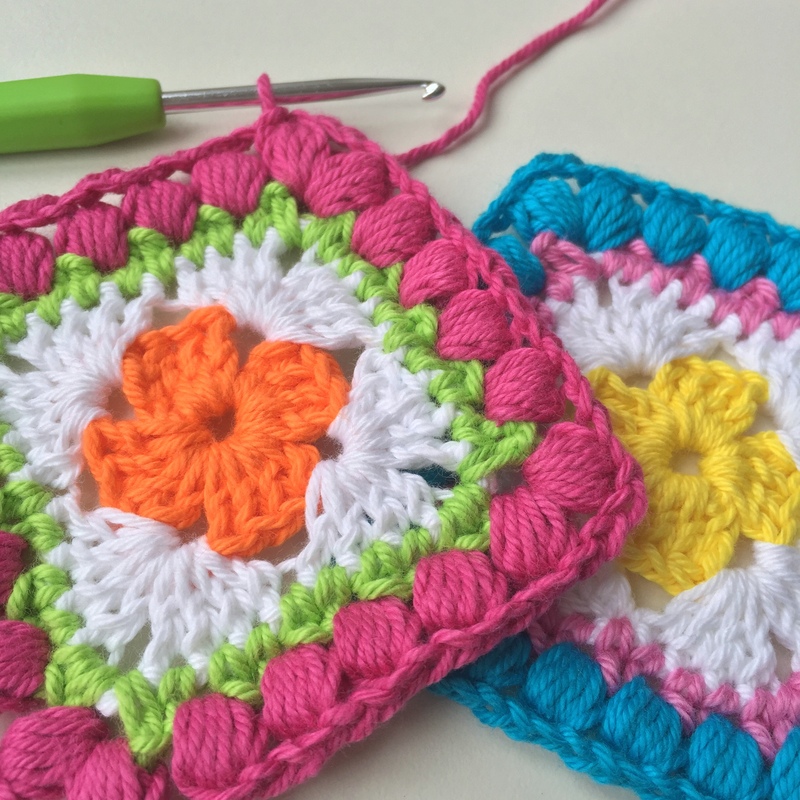 Next you’ll crochet 2 chains, skip 2 sc’s and crochet: * 1 bobble – 2 chains – skip one sc **; repeat from * to ** 3 times. The last 2 sc’s of each side are skipped as well; in the corner you’ll crochet again: 1 bobble, 4 chains, 1 bobble, 2 chains. 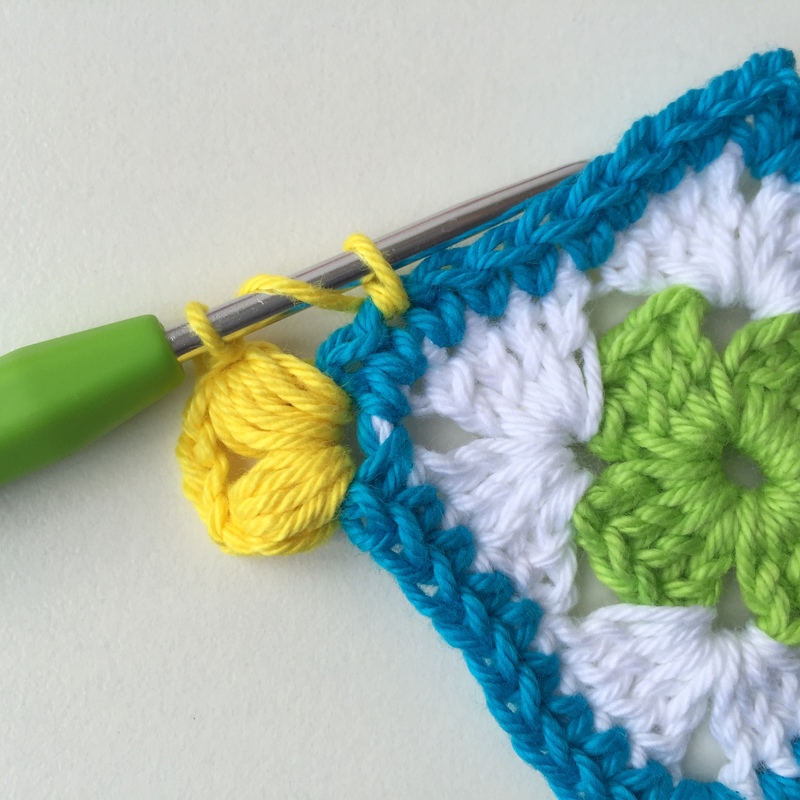 All other three sides are crocheted like this – please pay attention to the fact that before and after each corner 2 stitches are being skipped! Close this round with a slip stitch into the top of your first bobble, and fasten off. Each side now has 6 bobbles; in each corner we see 4 chains. note 1 = “start”/first bobble stitch: pull up a loop (make it a little bigger), yarn over, pull up a loop, hook into same space/stitch, pull op a loop. Repeat this until you’ll count 9 loops on your hook. Pull yarn through all 9 loops. 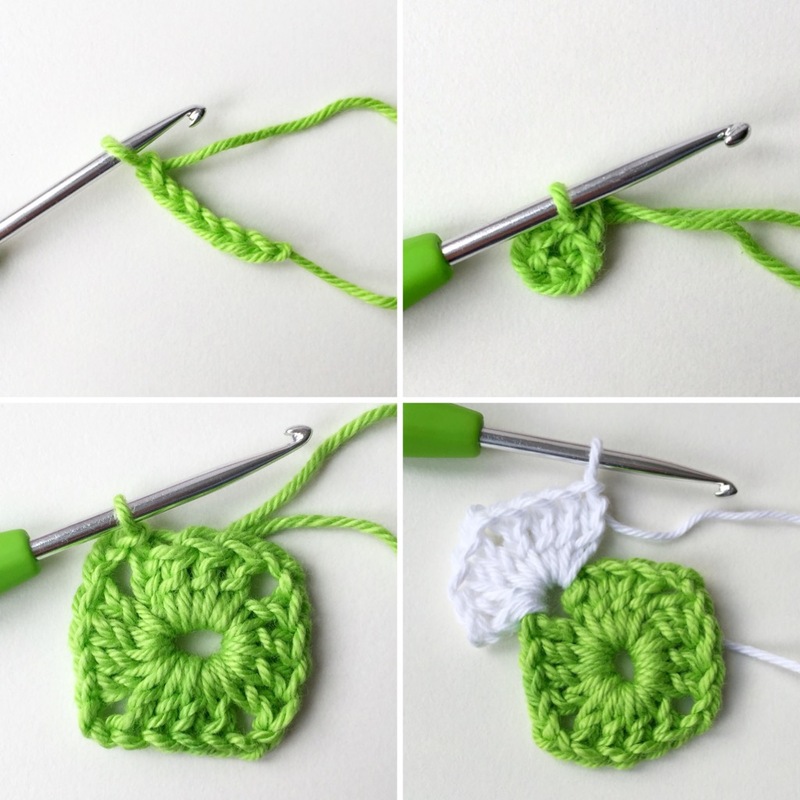 note 2 = “regular” bobble: since you’ll already have a loop (stitch) on your hook, you’ll now want to: yarn over, put your hook into the stitch where you’ll want to crochet your bobble stitch. Repeat until there’s 9 loops on your hook again (first stitch included), pull yarn through all 9 loops.